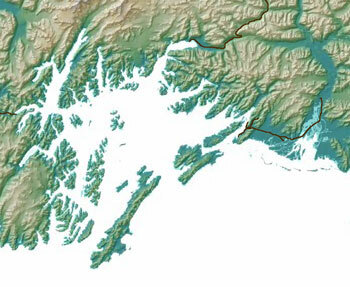 Prince William Sound encompasses 3,800 miles of coastline, bounded to the east and north by the Chugach Mountains and to the west by the Kenai Peninsula. Commercially important for the fishing and oil industries, the sound is also prized for its abundance of marine and coastal life, its rain forest of Sitka spruce and western hemlock, and its glacier-studded landscape. The sound contains 150 glaciers including 17 tidewater glaciers, known for dramatically calving huge ice chunks into the sea. More than 220 species of birds, 30 species of land mammals, and at least a dozen marine mammal species are found in the region. Bald eagles are plentiful along treetops and shorelines. Among the estimated 200,000 seabirds that summer in the sound are marbled murrelets, black-legged kittiwakes, and glaucous-winged gulls. 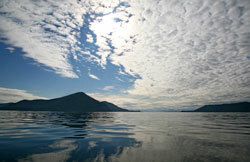 Along western Prince William Sound, black bears may be seen on narrow beaches below mountainous, glacier-choked vistas. To the east, including on Hinchinbrook, Montague, and Hawkins islands, brown bears roam their favored lowlands, and are most often seen fishing when the salmon are spawning. Don’t forget to keep an eye out for moose and mountain goats as well. Resident marine mammals include humpback, sei, fin, minke, and killer whales as well as Steller sea lions, harbor seals, and sea otters, all of which reach some of their greatest numbers in Prince William Sound. Though rugged and wild, the sound is easy to access. Through a tunnel roadway completed in 2000, the western Prince William Sound community of Whittier offers a gateway to this marine wilderness about an hour’s drive from Alaska’s largest city, Anchorage. You can also access the sound from the north, at the port of Valdez, via the Richardson Highway. The Alaska Marine Highway System provides year round service linking Whittier, Valdez, and Cordova. Check the ferry schedules at the Alaska Marine Highway website.